30th April, Cairo: Three-time tour first runner-up and newly-crowned Sinai Open champion, Yousif Falah finally nailed his first-ever tour title by defeating team-mate, Masoud Saberi, 217-180 in an all-Bahraini championship match of the ABF Tour Egypt. The top seed had earlier brushed aside Kuwait's Jassim Darwish, 254-149 in the first semi-final to reach the final while Masoud edged Thailand's Yannaphon Larpapharat, 191-187 to face his compatriot in the final. Masoud started the match stronger of the two with a double in his two opening frames but failing to spare his third frame allowed Yousif to move ahead by just 7 pins. 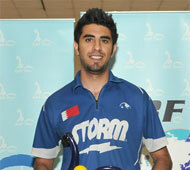 Yousif's split in the seventh frame allowed Masoud to draw level again. A quick change of line made by Yousif saw the lanky Bahraini firing five consecutive strikes to close out the match with 217 while Masoud encountered a split in the eighth frame. And despite a double in the tenth, Masoud settled with 180. "I didn't think the match was going to be easy as Masoud had bowled well to reach the finals," said the 28-year-old Yousif, who won the 14th Sinai International Open title yesterday. 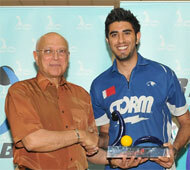 "Bahrain has never won an ABF Tour title and to have two in the finals is simply fantastic." The victory was Yousif's first-ever tour title after having finished second on three occasions. The champion sailed past Kuwait's Fadhel Al Mousawi, 234-189 in Round 1 and was equally impressive when he defeated Egypt's Mahmoud Mazloum, 235-218 in Round 2. Masoud breezed past Bahrain leg champion, Andrew Frawley of Australia, 233-189 in the first round and defeated Thailand's Peerawich Rungchareon, 200-177 in the second round to advance into the semi-final. Second runner-up, Yannaphon sailed past three-time Asia ranked No. 1 and 2009 ABF Tour TOC winner, Hussain Al Suwaidi of UAE 248-200 in the second round to reach the semi while Jassim ousted Bahrain's Mohamed Sultan, 218-179 to book his place in the semi. Yousif's victory also moved him into the top of the tour rankings with 135 points to overtake Kuwait leg champion, Hareb A Mansoori of UAE, and Thailand leg champion, Wu Siu Hong of Hong Kong both tied in second with 120 points. Mr Farouk Haridi, ABF Exco-member and Egyptian Bowling Federation board member, gave away the champion's trophy to Yousif Falah. The next stop will be in Hong Kong, China on June 10 after the 38th Hong Kong International Open. This year's ABF Tour consists of eight legs - four in the Middle East without women division and four in East Asia with women division.